Durable, and stylish, this digital full-size watch will add convenient style to your day. 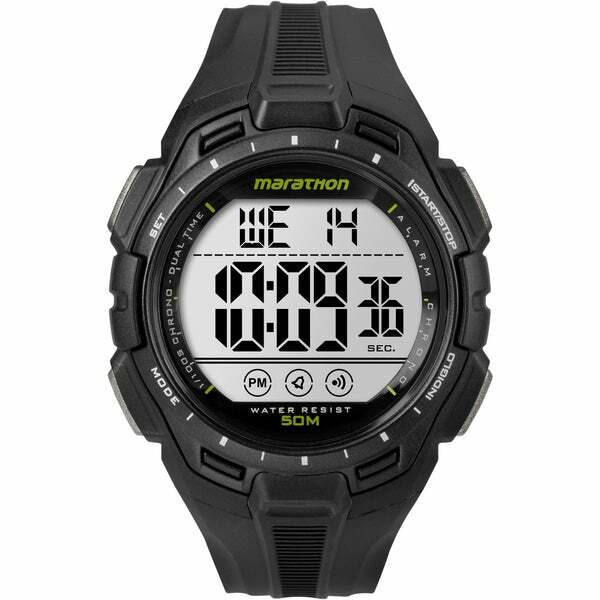 The sport's watch features a digital display with a daily alarm, two time zone settings, 24 hour stopwatch and an Indiglo night light so you can view the time even when it's dark. The simple black strap secures with a buckle closure, completing the masculine and practical appeal of this handsome watch. I wanted a larger watch and the face is good size but it just sits to high up. Just wish it was not so thick, otherwise I like the features and look of the display. Timex Marathon by Digital Full-Size Watch. Thanks Shipped within time frame issued at checkout. The watch is OK but has some deficiencies. It is not very water resistant. Secondly the stopwatch goes back to zero after 30 minutes. Thirdly, the stopwatch display reverts to the time after a couple of minutes. Though not major problems I find these annoying. Love this watch! Very classic looking and very functional! I use it for an everyday watch when I don’t want to wear my Citizen watch. I wear this watch out in public, swimming, working in the yard, etc... Great watch for a great price! I would recommend this watch to anyone looking for a rugged watch for outdoors, work or play. It keeps great time with date. The indiglow shows up great in dark conditions. This watch lives up to the Timex name. It almost looks like suunto core watch. I like the sleek styling and low profile. The large number are great to read. I have used Timex watches for many years because of the name and quality. I bought this watch for my friend with glaucoma & she loves the big numbers & the indiglo night light! Timex watches are all usually good. This one has a large dial for us blind folks who need a bigger dial. Easy to use. watch came with no instructions visited the Timex website and there is no instructions for this watch. Much to like: large easy to read digits, easy to set and use, but it is very thick and catches shirts, jackets etc. I didn't pay enough attention. It's easy to figure out. Paper in it is in several languages telling you to go on line?? Made in china?? Very simple and easy watch to use. I have it enjoyed it very much. A must have for every man. "Does this watch have a count down setting? If yes, does it alarm at the end of the countdown?" "My husband is having an issue setting the time as well. No instructions." "Timex does not have a manual for this watch stuck with a watch that I can't set please help." Hello tansaih, you will be contacted by Customer Care with a manual. Have a great day! Large dial that I can read.